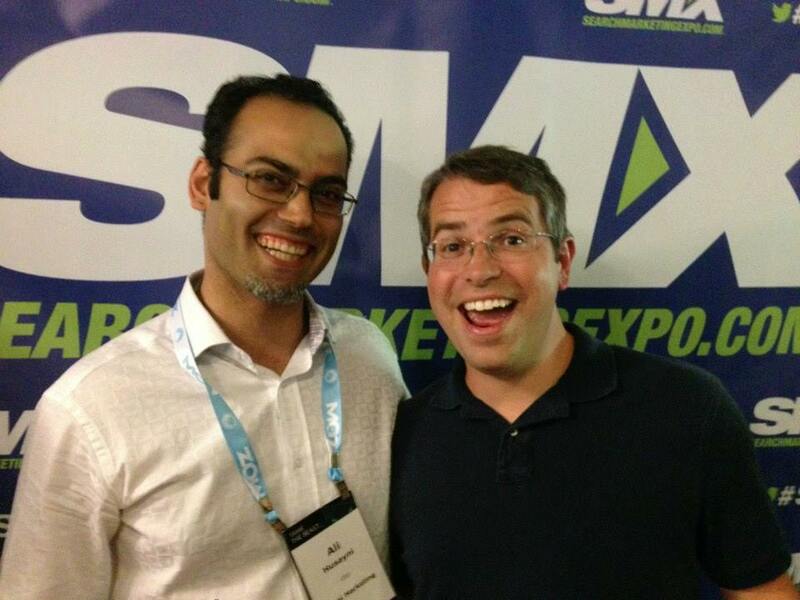 SMX Advanced 2013 was amazing, as always. Danny Sullivan, Matt Cutts, Bruce Clay and many other influential online-marketing professionals came together for an intense two day conference on SEO, SEM and SMM. The attendees varied from mom-and-pop small businesses to multi-billion dollar corporations. The keynote You&A session with Cutts and Sullivan which happened Tuesday at 5 pm was phenomenal. From multiple angles Sullivan “attacked” Cutts and Google’s search algorithm’s crazy swings. Most of the questions put to Cutts from the audience were also related to algorithmic updates. “We have over 500 changes that happen, algorithmic changes, every single year and so on any given day we’re usually launching one or two things,” said Cutts. Why they have so many algorithm updates is a good question to ask. I met Cutts after the conference and told him I felt he lied in his You&A session. He was furious and said that “he’s incapable of lying”. I agree. He is a very kind and caring person and very ethical. So, maybe he’s misinformed. After Rand Fishkin’s recent blog post on Moz.com regarding the disavow tool and how it helps “REDUCE” your ranks on Google as well as our own internal tests with this tool, there is no doubt that the disavow tool doesn’t help any sites. Other SEO gurus at the conference agreed. They believe Google uses the disavow tool to “identify” bad sites to help them weed out the so-called “spam”. But how accurate are they? Although there may be some merit to the above, I see this as a total marketing stunt to separate the big brother from the rest of the crowd and make Cutts the white knight of the Internet world. Contrary to what Cutts is trying to portray, Google has said previously that each year, they release the information on hundreds of individual Google accounts to the “authorities” without informing the users. In fact, USA Today published an article Tuesday talking about this. When he said that, people around me responded by saying “what is he talking about?” They’re right. We have effectively used press releases for over four years and I’ve often seen that a simple press release published on a site like PRWeb gets that site ranked at the top of the search results. For those of you who don’t know Clay, I say he’s the “father of SEO”. I met him in person for the first time and it was a great experience. We talked about how crazy our industry is and how it needs to be transformed. He agreed. He told me that he’s going to meet with government officials to help standardize the SEO world. I cannot agree with him more and I wish him the best. I was looking forward to meeting Fishkin, but he didn’t make it to the conference. He was still in Europe after his keynote speech at the conference in France. Looking forward to your thoughts and feedback. If you want an example of SEO gone awry, just put any phone number in. Even a number that ls listed on the contact page of a website or the phone number of a well known company. The first 100 pages are similar sites that want to text you the owner of the number\’s name and address for a fee. That is 100% spammy SEO if you ask me. I can\’t believe google lets that go on this long, they should suppress all of those sites. Excellent article as well as thoughtful comments! It is nice to see someone taking an honest and professional look at the statements Matt Cutts made instead of the usual swooning over every remark he makes. I personally believe the man is a pathological liar, but that is just my opinion. What I can state as a fact in my area of expertise (aquariums and ponds with over decades of experience & research), is that the results since “Penguin” & “Panda” are often not just spammy, but downright scientifically inaccurate. Searches for “Aquarium Planaria” and “Aquarium Nitrogen Cycle” bring up scientifically INCORRECT information. Sites with poor content are now king (at least in my field of expertise), with cut & paste websites now popping up more than ever. Back to my opinions, I believe Matt Cutts knows full well that the results are junk and favor Amazon, About.com and other big entities that make more money for Google. You can\’t expect Google to come clean with the information you really want, now can you? That would result in miscreants subverting the search results. Oops, too late. Miscreants are already doing that. I don\’t think he\’s lying. The changes on the Web may need more time to reach a stable state. Ali, watch what you wish for with that Bruce Clay \”government\” statement. Anytime you want low performance just get the government to do it, you automatically get low performance. Whenever the government gets involved there are invariably unintended consequences. [I met Cutts after the conference and told him I felt he lied in his You&A session. He was furious and said that “he’s incapable of lying”.] By the way when someone says he is incapable of lying that is a lie 😀 it\’s a paradoxical statement. I think they are working to make search engines with no spam links indexed so that the query that is generated would be really helpful to get a better result. Your points have worth and your arguments are interesting. I also think that Google announced something but they always keep somethings hidden. After reading your points and arguments I learned a lot of things from it. It is my dream to meet Matt Cutts, he is the man who is handling all these algorithms we have to face on a daily basis. This is a really nice post and I am impressed that you met Cutts. What exactly is Google updating in their S.E Algorithm ? Please help me to increase my website traffic. Content is the King-LIE – You are somewhat correct. Content IS king but ONLY if correctly presented. Here I have to agree. Google turned off linking\’s influence when they removed PageRank as an influence on SERPs. However, from looking at Google\’s (modified) help pages it seems that PageRank is now a minor SERPs ranking factor. SEO, if done properly, can help people understand the relevance your pages present. It is not about tricking the search engines, it is ALL about the presentation of relevance. I\’m sorry but the statement \”He said that he’s \’incapable of lying\’\” is, in itself, a lie. If this were true, we would have to consider the definition of \”incapable\”. a. Lacking the necessary ability, capacity, or power: incapable of carrying a tune; incapable of love. As far as I can see, MC is neither of those, so by default, he IS capable. Nice smooth post Ali :D, I\’d like to know what was the idea of the audience about SEO\’s future? Your \”questioning\” Cutts and sharing the \”truth\” further instills my confidence in your integrity. So often when someone has such a big name in an industry, like Cutts with SEO, what they say is taken as truth and never questioned. You listen with the intention of understanding and learning so you can help your clients improve their ranking unnlike some, who attend conventions so they can regurgitate what they heard to potential clients to make a buck. I\’m interested to see if Cutts ends up publicly addressing/clarifying the statement he made. It would have been cool to see what Rand Fishkin would have said, had he been there. @ Syal: Thank you for your comment. I agree and disagree with you. SEO practices like posting quality content and generating good back-links is just one part of the overall picture when mastering online marketing. Things like social media sharing and converting visitors into paying customers builds on content and back-links. As far as SEO being a joke, that’s a major point of controversy right now. To me, optimizing your site so people searching for what you have to offer have an easier time finding you just makes common sense. Awesome post, Ali. I’m glad you met Matt. Was there no chance to challenge him on his statements? I actually did confront him. He said that he\’s \”incapable of lying\”. Then I said, well… disavow tool hurts sites instead of helping them. what do you have to say? \”things will get better…\” is how he responded. Actually your lie list can be extend far further. Awesome post, Ali. I\’m glad you met Matt. Was there no chance to challenge him on his statements?